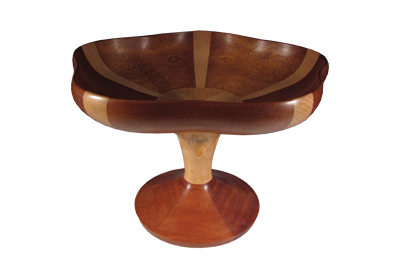 It is always interesting to meet other makers in the field of woodturning, and people working in relative isolation often come up with ingenious ways to produce their work. This could not be more true of Rod Tallack, who produces extremely distinctive work on the unique lathe which he has designed and built himself over several years. I had heard that Rod produces some very interesting pieces, and was eager to meet him in his workshop to find out more. On arriving at his home in Dawlish, Devon, I noticed many sculptural forms on display unlike anything I had ever seen produced on a lathe. I could tell straight away that Rod was a thoughtful man who paid attention to detail, and I was looking forward to finding out all I could about how he came to create these unusual pieces. 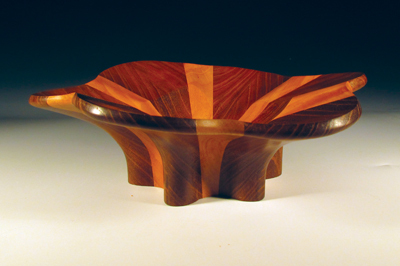 Rod first became involved in woodworking in 1945. His first job was as an assistant to one of many machinists employed at a timber yard producing vast quantities of joists, rafters and framing as well as architraves, skirting and floorboards for the building industry. To Rod, the smell of the freshly cut pine (Pinus spp.) was intense and wonderful, he even enjoyed the noise - at levels which would be illegal by todayâ€™s standards â€“ and the physical work appealed to him, too. These were days when there was little in the way of handling equipment; lorries were loaded and unloaded by hand; it required a lot of physical skill and strength if one was not to incapacitate oneself, but Rod was captivated. During these early years â€“ which included a two year break for national service â€“ Rod advanced through the mill by learning to operate all of the machines. While working full time, Rod managed to fit in three evening classes at college every week. Through this he obtained the full City & Guilds qualification as a woodworking machinist. Rod decided to move on, and over the next few years had a series of jobs in many areas of woodworking such as mass production furniture, bespoke furniture, mass production joinery, bespoke architectural joinery and coach building â€“ in the days when coaches were built using ash frames. 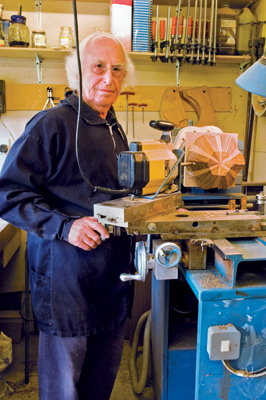 After this period of involvement in so many areas of woodworking, Rod spent three years employed as a planning engineer. This involved deciding which machines were to be used for each stage of a piece of work as it progressed through the workshop: â€œA bonus of this work was that half of the factory was devoted to metal work, which enabled me to gain a huge understanding of machine shop engineering practices such as use of lathes, milling machines and welding, which would later be very useful in the design and production of my own machine,â€ he says. Rod then returned to hands-on machinist work in a joinery firm for several years, before taking steps into teaching. He taught the trade of machine woodworking to adults at a government training centre first, which he found a very enjoyable learning and teaching experience, dealing with adults that really wanted to learn. After this he was employed as a lecturer in machine woodworking at a technical college, where he found 16-year-old lads a totally different proposition and challenge to those he previously taught. Eventually, due to a change in EU health and safety regulations it became his job to train lecturers up to the required standard in machine woodworking. After a decade of teaching, Rod decided to leave, setting up his own business sharpening and grinding saws and tools used in the timber and engineering industries. 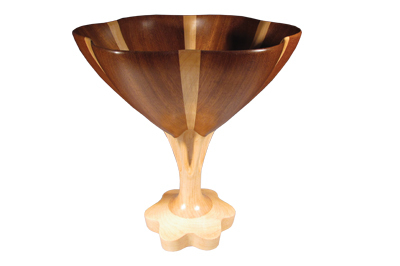 Rod describes his first ventures into woodturning as "a bit serendipitous, really." He had come across an article on ornamental turning and was amazed; â€œI had never set eyes on anything like the shapes that these lathes were capable of producing,â€ he says. While familiar with faceplate and spindle turning, copy and automatic lathes, and specialist machines during his time in the trade, the Holtzapffel lathe concept was completely new to him, and a concept which he found very interesting. Pursuing this new interest, Rod started on a project of research to design and produce a machine to suit his needs back in 1975. "I obtained a copy of Manual du Tourneur by L.E.Bergeron, but being printed in French which I could not read, I could only use the many illustrations for my research, as well as visiting the Science Museum in London to look at some ornamental turning machines,' he commented. With his vast experience of the workings of machinery, he decided the new machine which he would build from scratch would be capable of non-circular turning. Designing and building this machine was, understandably, quite some undertaking. The first issue in designing the machine Rod came across was his background as a wood working machinist. In machine woodworking he states things happen quickly and he could machine at rates of 250ft per minute, and Holtzapffel although capable of fine intricate work, was far too slow for what he had in mind, so, therefore he looked to other solutions. As well as rotating, the main spindle had to be able to move along its axis, which conflicts with any standard lathe design. Additionally, a primary faceplate was necessary; one that could be made to move horizontally across the lathe bed as the plate rotated, with a router being incorporated to remove the wood as the plate rotated and moved across the cutter's axis. Rod comments that he built the machine on a shoestring, affectionately describing it as, "a real Heath Robinson affair." After various modifications the machine worked in the sense that he could see what could be achieved with such a machine; he had successfully designed a machine where the main mandrel of the lathe would oscillate in its length. Work on a new model began. With the advent of his innovative second lathe, Rod had considerably more scope for experimental work. It is an impressive machine and like no other I have seen to date. The fact that Rod designed it from scratch is astounding. Accompanying the machine Rod also designed various aluminium cams and moulds that are attached to the back of the main spindle and the cross table, onto which a router fits and is moveable in fine degrees of both angle and depth. As the machine was switched on I watched in amazement as the faceplate onto which a chuck was fitted not only rotated, but moved back and forth along the central axis of the machine as well as across and back over the table with an industrial rhythm. A router is fixed in position to cut away the wood through this multi-axis movement, and can be set to varying depths and angles producing an infinite number of variables. All this took me quite some time to take in, and to say it reminded me of rubbing my stomach while patting my head would be an understatement. The non-circular shapes which he is able to turn with this machine make his pieces characteristic to say the least. 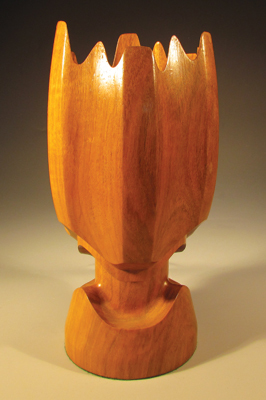 He initially started out with a variety of sculptures, followed by a selection of vessels. Some of the pieces were sold, but unfortunately the price in no way reflected the work he had put into them. While Rod states a belief that "experimental work is never cost effective," it is clear that experimentation is essential to his working method. He is always trying new ways of working with the machine, with different shapes and styles. A problem he has encountered with this approach is the difficulty in finding cost-effective materials to use for speculative pieces. He would rather not waste money on purchasing expensive wood for speculative work; when he first started turning, his workshop quickly filled up with failed projects. Rod states that at this early stage, it would have been nice to have had the opportunity to discuss problems with like minds, but this was completely new ground, and before the internet; there just wasn't anyone else to chat with. Rod's solution was to take small pieces of wood which he already had, and laminate them together to create blocks suitable for turning his various design experiments. It is good to see a turner with such initiative, who is always trying to develop and broaden their output. Rod enjoys creating works which utilise geometric shapes and sculptural forms, and likes his work to incorporate graceful, flowing lines, which he feels help to create a strong visual presence. Due to downsizing homes, Rod had to limit the size of his workshop somewhat. Measuring 3.2 x 2.1m, a large part of the floor space is taken up with the lathe which Rod built himself over many years. Due to the noise you might expect from such a machine, the workshop is triple lined with insulation. The rest of the workshop is highly organised, with no space wasted. "It was necessary to rationalise my tool collection before we moved," Rod explains, "almost all the tools and equipment I have now are considered necessary - there's nothing here I couldn't do without." Rod's work ethos begins with designing projects which are interesting to him. While he accepts that it is nice to have his work appreciated, he is ultimately more concerned with producing designs which he finds interesting and challenging himself. Rod reflects, "one of the benefits of age is that there are no pressures any more." I asked how long it takes him to produce a piece, which he likened to the proverbial piece of string. In comparison to using a regular lathe, Rod's method can be slow; the option of sanding as the lathe rotates is not available to Rod, with all finishing being done by hand off the lathe. The workpiece rotates at 100rpm while moving to and fro across the bed, and back and forth along its axis. It takes Rod two to three hours on the lathe, followed by several hours off the lathe to produce a piece, if all goes to plan. 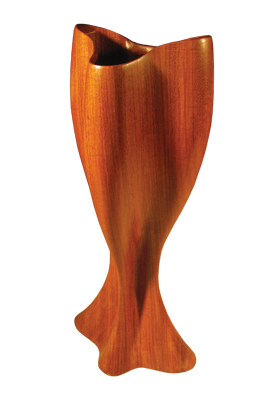 Although Rod has already achieved a huge amount, when I asked him about his hopes for the future he showed no lack of ambition: "Having produced a machine that will turn wood into shapes that are not circular, the challenge now is to develop a genre that another individual is willing to take up and develop." 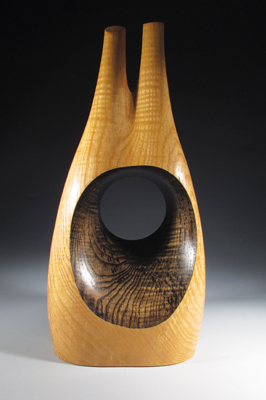 It is a testament to the integrity of Rod's work that he not only aims to advance his own work, but the craft and trade of woodturning as a whole. Rod has an interest in creating a new style which is desirable to a discerning public, and will sell for the proper rate: "It's important to make things as a hobby, but I'm not too happy about selling work that has taken me many hours to produce for a silly price." He goes as far as to say that it is better to give work away to friends, relatives or charity shops than to sell it for less than it is worth. It was a fascinating experience meeting Rod and viewing his wonderful sculptural work, his incredible machine and working methods. I am keen to see how his ideas and methods develop - both for his sake and for the wider turning community - and wish him all the best.